Do you have a cat? If you are a DIY fan, then we bet you’re going to be thrilled to know there are lots of projects out there especially for cat lovers. You can make your feline a kitty condo, cat tree, cat scratchers and other types of kitty furniture. One of the best things about DIY-ing your cat condo or other types of kitty furniture is you can easily match it to your home decor. When you buy it in the store, you are simply at the mercy of whoever has designed it for pets. Sometimes it fits in with your living room or porch and other times it does not. But if your DIY it, its easy to custom create it using colors, patterns and other accents that easily blend nicely with your living room, so you get your mother-in-law to give you the thumbs-up on your latest DIY project! But most importantly – you’ll get a huge thumbs-up from your cat! Because no one knows your cat better than you do. You realize if they love to climb or have a favorite place to sleep or other special things they like to do. You can custom create a cat condo or other kitty furniture to easily match your feline’s purrsonality and temperament. So if they especially love to nap on towels, why not use towels as the fabric on the inside of the condo? We’ve found you 40 fun feline approved DIY projects to try. Some are especially ideal for beginners and others are better for more advanced DIY-ers. So what are you waiting for? Your cat is eagerly looking forward to their new, fun playspace! Happy DIY-ing! Here’s a cat tree you’ll be glad to have in the living room. Its made with real tree branches. Isn’t this cute? Its a sweet house for your cat. Fun to climb and nap on. Its also pretty for your home decor too. Isn’t this cozy? Fun to climb on too! Here is a classic scratching post. Your cat with love this! What’s so fun about these is a cat can basically climb your walls! Fun for kitties who love to climb and be active. Isn’t this fun? Your cat will be so cozy here. Isn’t this charming? It looks like a mousetrap! Doesn’t this look natural? A tree stump as a cat condo. Here’s a unique DIY Cat Condo…made from a stool! A fun project. Does your cat love to climb? Here’s a fun climber for them. Now you’re cat is really ready to have an adventure! This will look great in your home too! Love the rustic look? Give this cat tree a try. Here’s a sweet and cozy bed for your cat. Isn’t this adorable? 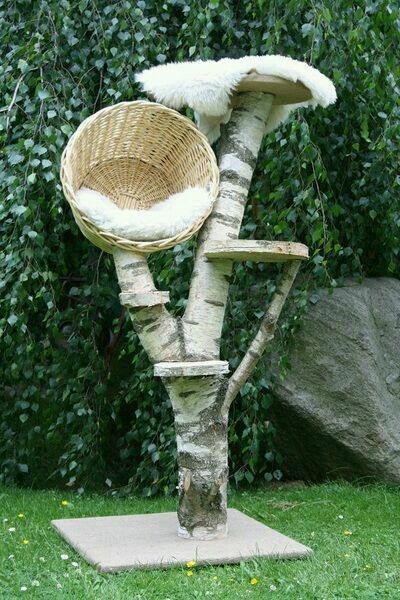 This is a very stylish DIY cat condo. Made from baskets. Does your cat love to climb? This is the perfect addition to your home. This is rather unique, the shape is actually a flower. Your cat will love this! Do your cats spend time outside when its cold? Here’s a cat condo just for them. Here’s an eco-friendly use for old wine crates. Your cat will be so happy too! See how cozy the cats are? They can sleep and climb. Want your cats to stay active? Give them a DIY activity wall! Look at how cozy this is. Its great to DIY. This cat condo is perfect for multiple cats. Its great for sleeping and climbing. Its mostly upcycled, which is impressive. It also offers a variety of things for any cat to do, which is very cool! Any cat would love to scratch their claws on this? Its simply purrfect! Here’s a great kitty condo for beginners to DIY. Your cat will be nice and cozy. How pretty! This will encourage your cat to climb. What’s so great about this is it has natural tree branches, ropes and lots of things to climb on. DIY this for your cat! Isn’t this adorable? A cat condo that looks great for your porch too! Do you have an urban kitty? Why not give them a skyscraper to scratch on. Here’s a fantastic cat tree. Lots of room to climb. Perfect for climbing. Best of all, its so pretty. Does your cat love to climb? This is a cat tree for them. Here is a classic kitty condo, complete with soft carpet covering it. Its ideal for several cats. Isn’t this sweet? Perfect for your cat to scratch their claws in. Here’s a great cat condo. Perfect for climbing and napping. Why, you’ll wish there was a bigger one for people too! Its so cozy, perfect for your cat. Give your cats a stylish place to scratch. Here’s a great DIY project. This cat condo has been through a remodel. Look at how happy the cats are. Now this is totally DIY and very unique! We bet your cat would have a lot of fun here.